will be held Sunday December 2nd , 2018. Tickets are available the day of the tour for $30. 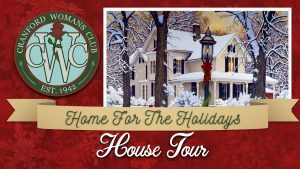 This year our self directed tour features 4 beautiful Cranford homes lovingly decorated for the holidays. Attendees will be guided through each home where volunteers will share information on the special details of each one. Stop by our Hospitality House, where you are invited to share in some light refreshments. In your interest, and our homeowners’, please wear low-heeled, comfortable shoes. Please, no children under 12 or photography.